This site is run by a group of keen walkers who love the outdoors and are concerned about the environmental impacts of cars. Our website provides hundreds of free, easy-to-use walking guides that describe the best UK walks reachable by bus and train, coach and ferry. Our routes differ from other websites: we don't go for the "pass-the-small-rock-on-your-left" level of detail. We think that the best way to explore the great outdoors is with a train or bus ticket, a map, a compass and one of our routes as a guide. And a flapjack. To make it easy for you to plan your car-free adventures, each walk links to information on how to get to the start and finish by public transport. We've also collated the best information on travelling by bus or train - plus there is more useful stuff in our car-free guides. We aim for our project to have as little negative impact on the environment as possible. Our Environmental Policy sets out some of the things we do to keep ourselves sleeping well at night. Our website is a good old-fashioned labour of love. We're non-profit but we do have to cover the costs of running the site. So, if you like what we do and are interested in sponsoring us, please get in touch. Alternatively, if you can offer a prize for our quarterly prize draws, we'd love to hear what you can offer. We were delighted to have won the PEA (People and Environment Award) for Responsible Travel 2012. 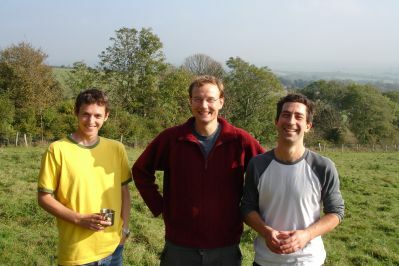 We also featured on the 2011 Green Travel List, organised by The Guardian and Green Traveller. We were also 'Highly Commended' in the 2009 Green Awards, and nominated for the ﻿National eWell Being awards and Sussex Eco Awards that year as well. The Car Free Walks team are experienced in writing articles and providing expert opinions for the outdoor or national press. If you are interested in what we offer, click here for further information. You can also download and display one of our A4 posters below - just click here to download a high-resolution PDF or let us know and we can post some out to you. 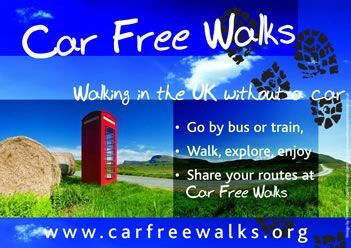 Join our Facebook group to network with other Car Free Walkers and we are also on Twitter @car_free_walks. We send out a quarterly newsletter to our registered members and Facebook group, with updates on what's happening. And if you haven't already, why not read up on our car-free walking weekends!